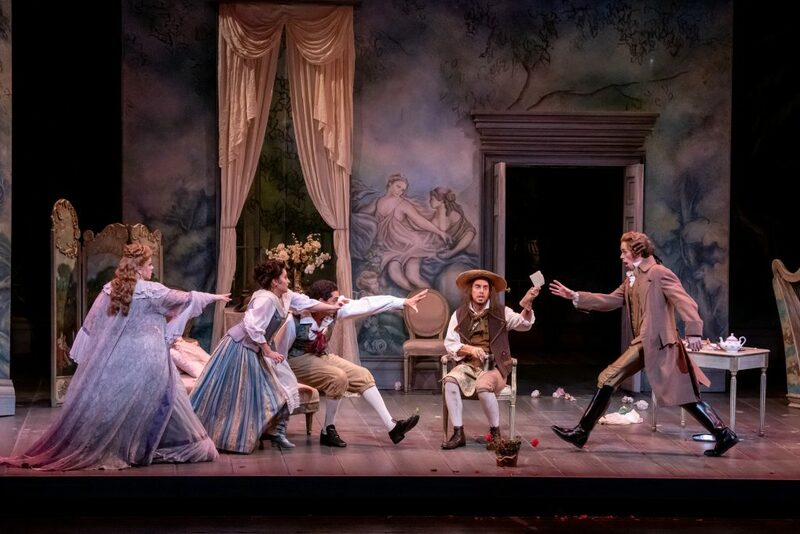 Mozart’s The Marriage of Figaro, seen in Broward Center’s Au-Rene Theater on Friday night, was a tribute to Florida Grand Opera’s excellent Young Artists Studio. Recent alumni took on three of the four leading roles, with all supporting characters assigned to current members of the program. Conducted with vigor by Andrew Bisantz and buoyantly staged by Elise Sandell, the result was a remarkably fresh-voiced, athletic show, in which the energy level never sagged. Ensemble values prevailed over individual showcasing and the entire evening – 3 hours, 10 minutes; including a 25-minute intermission – was permeated with animation and fun. Well, not all fun, perhaps. Mozart based his 1787 opera on a play by the French revolutionary Beaumarchais, in which the servants Figaro and his bride Susanna hold the high ground, outwitting the despotic and amoral Count Almaviva in a society where this would have been impossible in real life. Mozart’s score, a gem of beauty on its own merits, mixes the serious with the comic, providing added dimensions by delineating each character with his or her own specific musical language. The Count’s lines are gruff, atypically un-euphonious for Mozart, underlining his self-centered sense of privilege, his indifference to the feelings of others and the misogyny that was pervasive in that era. With a hard-edged, penetrating baritone, Jonathan Michie embodied the egoistic despot in a way that had implications for modern times. Figaro’s music is more flexible. His first aria (“Se vuol ballare”) a manifestation of suppressed anger, his second (“Non più andrai”) lightheartedly ironic, his last act tirade against women a multifaceted outpouring of personal sorrow and inner conflict. It also lies lower in the bass-baritone range. Mozart typically gave the higher lines to characters higher in social status. Calvin Griffin’s bass-baritone was softer-grained, his stage demeanor deceptively self-effacing. He sang with admirable legato (smoothness), though weakening at times when the lines were too low for him to project. The Countess, arguably the most lovable female character in all opera, has two exquisite arias in which she expresses her helplessness and heartbreak over the brutality and faithlessness of the man she loves despite his flaws. Each monologue is a challenge to every aspect of classical vocal technique. In her entrance solo (“Porgi, Amor”), she implores the god of love to give back her husband or let her die – in sustained melodic lines and scales that must be even and pure. Russian soprano Lyubov Petrova, appropriately the most mature singer in the cast, was elegant in bearing and noble in the best sense of the word. Once a light coloratura soubrette type, her voice and physical bearing have developed – her tone grown juicy and expansive, her ability to color the words now capable of a broad palette. Susanna gets the largest amount to sing, but mostly in recitatives and ensembles, where she controls not only her employers but also her husband-to-be Figaro. In the very first duet, Figaro is measuring the room in sporadic phrases, while Susanna sings a pretty tune about her wedding cap. By the end of the duet Figaro is looking at her hat and singing her tune with her. Only just before the opera’s finale does Susanna get a real solo turn, and then it is the simplest, least showy aria in the opera (“Deh, vieni, non tardar”) describing her love for Figaro. Elena Galván filled the bill with a perky, likable presence, and a sweet timbre that easily cut through the ensembles and made the listener aware that she was the plot’s lynchpin. 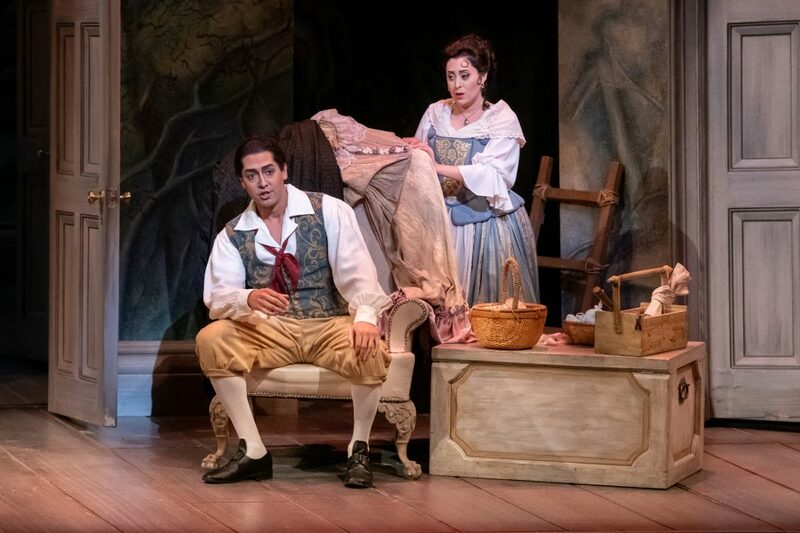 Oddly, her first aria – a throwaway action number in which she dresses the pageboy Cherubino as a girl – was cut, but Galván tugged at the heartstrings in her late-on solo. Mezzo-soprano Mariya Kaganskaya as Cherubino, portrayed the oversexed teenaged boy convincingly, conveying the hormonal conflicts of “Non so più cosa son” more persuasively than the page’s more restrained serenade to the Countess, “Voi che sapete.” Zaray Rodriguez, another promising young mezzo, successfully enacted the old Marcellina, who wants to marry Figaro until she learns he is her long-lost son. With a resonant bass voice and splendid agility in fast patter, Rafael Porto made his mark early on, with a rousing rendition of his “Vengeance” aria. Dylan Morrongiello used his bright and pointed tenor to good effect in dual roles, distinguishing the malicious music master Don Basilio from the ineffective lawyer Don Curzio. It was one of director Sandell’s many effective subtleties having Basilio conduct badly when the chorus of peasants came on to sing at the wedding. Simon Dyer made the gardener Antonio seem like a larger role than it really is, while Evan Kardon was quite fetching in the half-aria of his very young niece, Barbarina. The Marriage of Figaro can be seen tonight at 6 at the Broward Center for the Performing Arts in Fort Lauderdale. Call 800-741-1010 or visit fgo.org for tickets, which start at $21; alternatively, call the Broward Center at 954-462-0222 or visit www.browardcenter.org.